Reign the Earth was a book that I felt like held nothing back. It’s a story about a girl who refuses to let evil prevail over her life and wants to find peace for everyone. There is definitely violence both as far as the persecution of a certain people as well as in a relationship. Shalia is a great character. She is a daughter of the desert and her feet will not fail her. She marries the villain of the story and this puts her in his direct path. I’m not sure I’ve read a story where the character is confronted in this way over and over. She comes into the story dreaming of peace and finding that things are not so simple. We see her change and grow as she sees both the horrors and kindness people are capable of. That blood and loyalty can have two different meanings. She might find herself hardening in some ways, but her love for others is her greatest strength and it’s not something that can be taken away. One of the things I loved the most about this book was Shalia’s relationship with her brothers. Maybe it’s because i have three older brothers, I tend to gravitate towards these kinds of things. The bond she has Kairos (Kai) is something that is a great comfort to her and the reader. I’m like oh thank goodness Kai is there for her. You don’t have to be a lone wolf to be a hero and it’s okay to need support. Her whole family is the type that it doesn’t matter if they are separated by death or distance they are this constant force. I love that. She also has her best friend Kata, who is like a sister to her. They also have such a strong bond and no judgement towards one another. So there is magic in this book. The Elementia are people who control the different types. Fire, Wind, Water and Earth. It’s very cool how the Earth element takes center stage. It always feel like that is the one nobody wants to be. You see how having the power over the Earth can be really cool! Shalia finds out that she also possesses powers, which puts her in a tricky situation. She doesn’t even realize the extent that Calix is willing to go in order to eliminate the Elementia, which is not limited to torture. As she comes into her own powers, she sees that you can’t hide who you are and this is where we also see growth in her. The romance was a nice slow burn that is forbidden. It’s not overpowering to the story but it’s there in the vein. You find yourself rooting for Shalia to find happiness at least somewhere. The book also deals with pregnancy, which is not something you often see in a YA and I found to be really interesting. 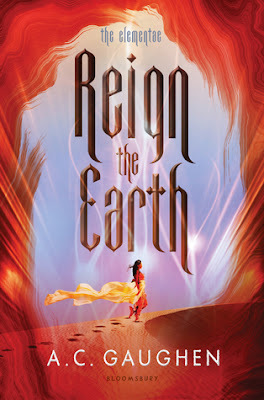 I really enjoyed Reign the Earth. I’m already desperate for the next one to see how things will go. I’m not sure what to expect. The book is violent and dark but also has a glimmer of hope that runs through.